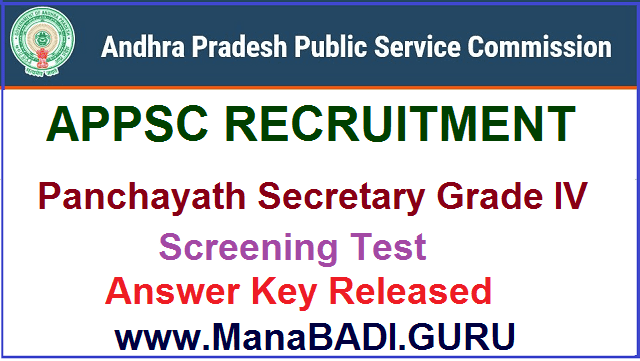 Andhra Pradesh Public Service Commission (APPSC) Panchayath Secretary Grade IV Screening Test Answer Key,APPSC Panchayat Secretary Group 3 Services Screening Test Answer Key to be released.APPSC Panchayat Secretaries Group 3 Screening Test Answer Key to be available on PSC Website. Andhra Pradesh Public Service Commission (APPSC) has conducted the the Screening Test for filling up of 1055 posts of Panchayat Secretary (Grade-IV) under Group-III Services on 23-04-2017 at 1430 venues in 13 districts. The exam was conducted from 10 am to 12.30 am. The Commission had made all the necessary arrangements for the conduct of examination. Interested and eligible candidates were sent online applications for APPSC Panchayat secretary posts. The APPSC has conducted Group 3 Panchyat Secretary exam on 23rd April 2017. Hence, all the applied candidates for APPSC Panchayat secretary posts were appeared for the examination. The commission would publish the answer keys soon in the official website. The candidates were allowed into the examination hall from 09.00 AM to 09.45 AM, on due verification of Hall Ticket and Original ID (Passport, Pan Card, Voter ID, Aadhar Card, Govt. Employee ID or Driving Licence). Extra time as permitted given to eligible disabled candidates. This examination has negative marking system with 1/3 rd mark deducted for each wrong answer. A Helpline and Command Centre are made available for the benefit of candidates and Invigilators. The PSC AP Commission would publish on its website, the key, after conduct of the examination. Any objections with regard to the key and any other matter shall be filed with in one week of the publication of the key on the website of the Commission. The commission will provide chance for raising objections on the answer keys of this panchayat secretary examination. The objections if any would be examined and the decision of the Commission in this regard shall be final. Any objection filed after expiry of one week from the date of publication of key would not be entertained according to the APPSC Panchayat Secretary (Grade-IV) recruitment notification from the commission.